Southern Pride Search Dogs is an all volunteer search team based in North Carolina. 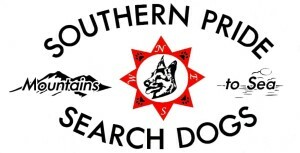 The team provides Search and Rescue K9 response for missing/lost people throughout North Carolina. Please note: We can only respond to requests made by local, state and/or federal responsible agencies. We rely upon donations to provide our members with training and certifications necessary to find lost and missing people. We believe the families of a lost/missing person should never be charged for search and rescue services. Check out our pictures under the "Team Training Photos"